Located near Llandaniel Fab on the Isle of Anglesey its name means ‘The Mound in the Grove’. Once upon a time, around 5000 years ago this would have been a ritual enclosure of upright stones. At the end of the Neolithic Age the henge made way for the passage tomb. 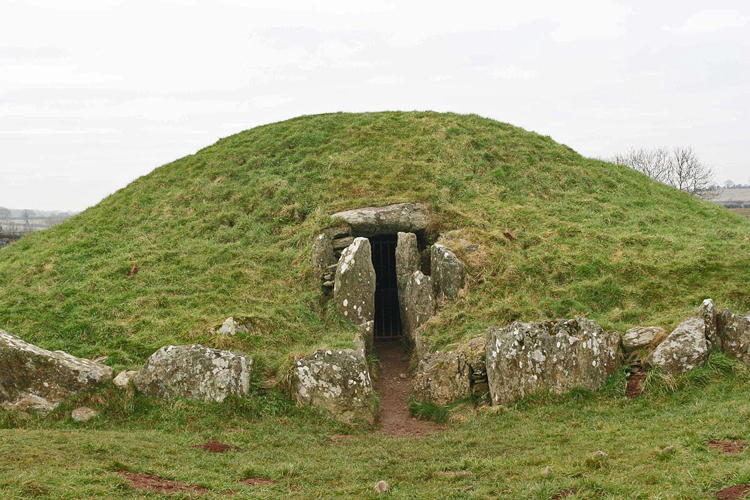 It is one of the first passage tombs in Wales but unfortunately it was excavated in 1928-29 when a major stone, ‘the Pattern Stone’ was removed to the National Museum of Wales and replaced with a replica close to the spot where the original stood! Concrete roof supports have also been added. There is an alignment with the summer solstice at this site. Bryn Celli Ddu is part of a cluster of Neolithic and Bronze Age features in the surrounding landscape and as late as summer 2017, after three summers of work, archaeoligists have discovered evidence of a prehistoric ritual landscape that possibly includes a cairn cemetery. (Guardian 21 June 2017).